Game of Thrones is Microgamings most advanced online slot concept to date. It offers players either 15 pay lines or 243 winning lines depending on betting preference. Based on the huge HBO series of the same name uses symbols from the television show along with 4 of the feuding houses. The Game of Thrones slot from Microgaming uses the five reel model, offers diverse betting options from just 15p to £37.50 per spin. It also offers a competitive 1,500 coin jackpot. In the 243 winning ways version, the top payout is 605,000 coins. It is one of the gaming industries most anticipated online slots and one of the top developments from Microgaming. But what can players expect from Game of Thrones. Based on the fantasy novels by George R.R. Martin the series follows the 7 Kingdoms of Westeros and the feuding houses that quarrel over the Throne. 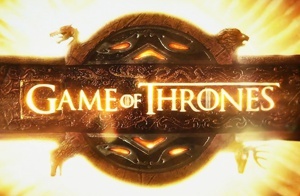 Game of Thrones is now one of the most popular TV shows produced for the HBO television network and has amassed an army of fans from across the entire globe. The show is renowned for it’s dark and brutal storylines and its tendency to kill off well-liked characters at key stages of the saga. Microgaming has built the slot around this great story. The slot has a wide release across Microgaming and Quickfire casinos and is available for both desktop and mobile applications. It means Game of Thrones could now become one of the best and most popular mobile slots for smartphone and tablet devices in the world! The first likeable trait of the Game of Thrones slot is the option cash players have to wager on two different versions of the game with 15 or 243 winning lines available. The core design frame uses five reels and incorporates some of Microgaming’s finest graphics to date. Also in the mix is the addition of the original score that provides an authentic sound, powerful animation sequences that offer interaction and a massive free spins bonus feature. The color scheme of the game is bang on the money too and helps to recreate the gritty atmosphere that the series clearly demonstrates. Microgaming have come pretty close and both fans of Game of Thrones and real money slot players alike with take something from it. Play the 15 pay line option and spins cost from 15p to £37.50, go for the bigger 243 winning lines slot, and spins range from 30p to £30.00 a credit. You can learn more about slots betting and pay lines in this article. The total number of coins available is 25 with coin values different for each version. The Game of Thrones slot jackpot is a modest 1500 coins with the slots payout rate riding between 95 – 96%. Coin values for the 15 pay line slot type are 0.01, 0.02, 0.05, 0.10, 0.20 and 0.25. Coins for the 243 winning line game are 0.01, 0.02, 0.05 and 0.10. Players can bet up to 10 coins in both versions of Game of Thrones. Top payouts are 187.500 coins and 605,000 coins. Microgaming have kept firm with developer’s card values and use J, Q, K and A as the lower prize values on the reels. Medium tier rewards come in the form of the four houses with Stark, Baratheon, Targaryen and Lannister family emblems representing payouts from 350 to 600 coins for 5 of a kind. The Game of Thrones logo plays the stacked wilds and feature in the base game as well as the free spins bonus round. The iron throne is the slots scatter bonus symbol and also the highest paying symbol of the game. Microgaming has equipped Game of Thrones for battle in terms of winning features and bonus rounds. 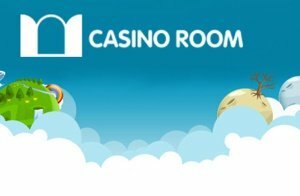 Real money players may come across the scatter round, free spins bonus or the gamble option when they play the slot for cash. All if this when combined makes for some serious action when you consider what’s on the table. Finding 3, 4 or 5 iron thrones on the reels will activate the free spins bonus. Players can then pledge their loyalty by serving one of the four great houses of Westeros. Follow either the Lannister, Baratheon, Stark or Targaryen banners and you’ll stand by the feature they represent. Each of the great houses has a feature with free spins ranging from 1 – 18 and multipliers of 2 – 5x. Each house will also have a number of stacked symbols that feature as part of the bonus too. It’s worth noting that free spins can also be re-triggered! The Scatter round is the next level down from the free spins feature and offers a random cash prize when players find two iron thrones anywhere on the reels. It is a great consolation prize for not quite finding three iron thrones and offers a backup with the chance to win a mysterious amount money. The gamble trail feature is up next and is great as it offers casino players the chance to go that one step further. 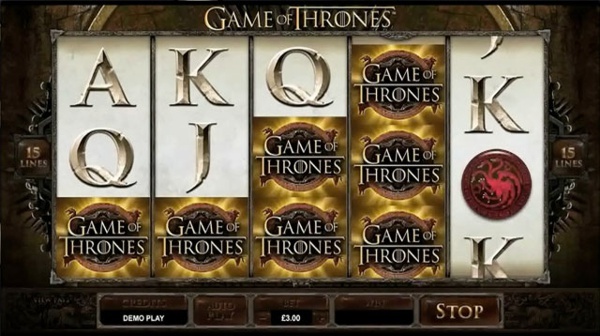 The gamble feature takes place using the map of Westeros and offers players the chance to advance to different locations whilst trying to double their money in the process. It’s an interactive feature with a White Walker, 3 Eyed Raven, Dire Wolf and a Dragon all featured in glorious video animation. Choose either heads or tails and watch your destiny unfold on the Game of Thrones slot. Are you brave enough to take a leap of faith? Game of Thrones is another impressive video slot from Microgaming and is on a quest to become one of the top fantasy online slots to rule the gaming world alongside Avalon II. With two layouts for betting in both 15 pay lines and 243 winning ways available, the slot knocks down walls to offer an economic and thrilling casino game for everyone. It’s undoubtedly Microgaming’s most advanced piece of work to date and lays the groundwork for some explosive slots to come. Whether you’re a fan of the awesome HBO box sets or simply looking for the next level of igaming. The Game of Thrones online slot sets an impressive theme for the ever popular design of Microgaming 243 or 15 betting line game variants. Jaw-dropping graphics, smooth animation, authentic sound score and multiple bonus rounds make the slot worth fighting over. But choose one of the great houses of Westeros to help you.